What is a realistic timeline goal for increasing soil organic matter content? Our “instant” culture gravitates to testimonials about how to rapidly increase soil organic matter by 1% within 1 to 3 years. 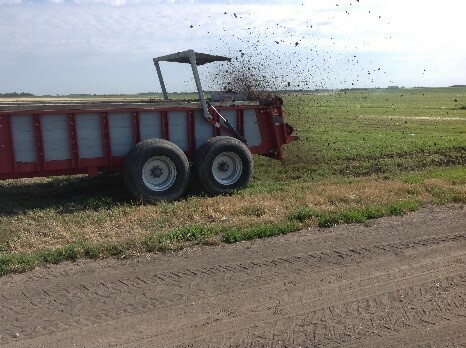 Conversations with lenders and landlords regarding rewards on manure applications and multi-species cover crops investments would likely be easier if financial rewards or measured soil physical properties came quickly. However, Dr. Sjoerd Willem Duiker, Penn State University Soil Scientist, says that a 1% increase in soil organic matter per year on a field scale is unrealistic. To understand why a 1% soil organic matter build might be a better ‘decade goal’ than a yearly goal; consider the calculations. For example, one acre of land (6 inches thick) weighs about 2,000,000 pounds. Therefore, 1% of 2,000,000 pounds equals 20,000 pounds which includes both the stable (humus) and unstable organic components decomposing within the soil. When manure, such as solid dairy manure, is applied to fields, soil microbes decompose 80% of the manure for their food sources. The remaining solid manure will only provide 90 pounds of ‘stable carbon’ per ton of manure applied for building organic matter. Thus, to increase the total soil organic matter by just 1% through dairy manure applications, it will require a total application of 222 tons (or about 20 tons applied per year for 10 years). Fred Magdoff and Harold van Es in their book, “Building Soils for Better Crops” (2nd Edition), outline that even applying 20 tons per acre per year of solid dairy manure will only increase organic matter 0.065% per year. So, if relatively high applications of manure are added to soils, it will likely only be possible to increase organic matter content 0.17% per year. 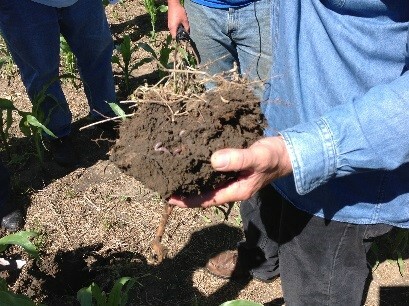 As a result, a goal of raising soil organic matter 1% would be far more realistic over a decade than one year. To attain this goal, it may be necessary to use other soil improving practices such as conservation tillage (limited till or No-till); cover crops; residue management; and nutrient saving manure application methods to enhance the soil building process. 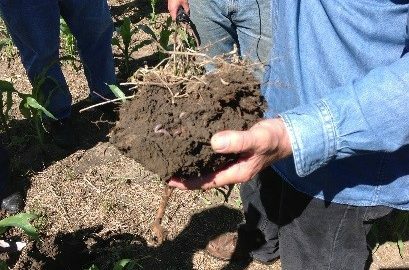 Soil health building through manure applications can be further increased through grazing and incorporating cover crops into rotations. During the grazing process, part of the plant root system dies; then more soil carbon and nitrogen energy is available for microbes which in turn fix more stable soil aggregates and soil humus organic matter content.